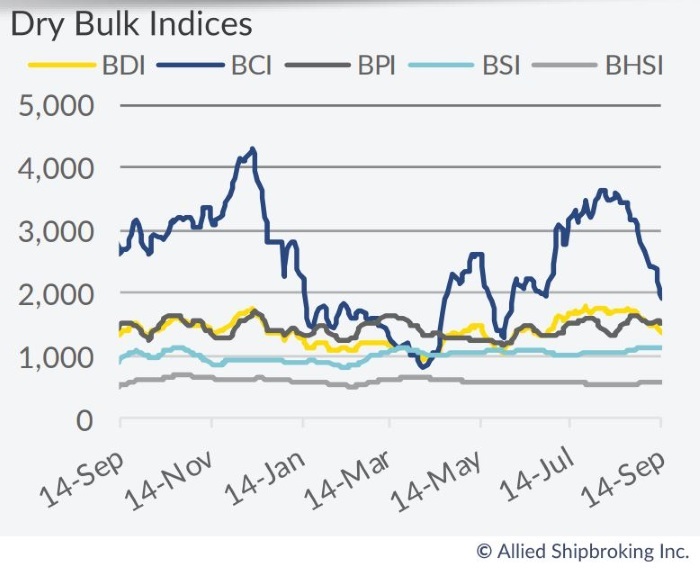 The dry bulk market is heading for a revival as a result of the balance achieved in the global orderbook, both as a result of a rebound in demand, but also because of a lack of available financing, says Allied Shipbroking. In its latest weekly report, shipbroker Allied Shipbroking noted that “it was 10 years ago this past Friday, when the world encountered the most severe financial crisis since the Great Depression. A crisis that affected the whole business world and led shipping markets into a tail spin recession unlike any seen in decades. In the summer of 2008, the BDI had reached its highest point in its history, peaking at 11,793 points. The booming market conditions noted since the latter half of 2003 had boosted market confidence to new highs, while many were proclaiming a new market reality was taking shape. This optimism, which as usual occurs at the top of any market cycle, had as a result a spending spree that was unmatched, as a consequence leading to the biggest orderbook pile up in history being held by shipbuilders. The orderbook had reached 3,700 vessels just before the collapse of Lehman Brothers in September 2008”. According to Allied’s Research Analyts, Yiannis Vamvakas, “the harsh impact of the crisis was swift and unpleasant for the dry bulk sector, though despite all this, the orderbook number fell by only 7% in 2009. The orderbook remained above 3,000 vessels up until the last quarter of 2011 thanks to renewed interest for new orders post the financial crash. With the end of the commodity super-cycle in 2011 we began to see a drop in the orderbook of 15% per year on average, reaching 863 at August 2018. As a result of all this, the fleet grew vastly in the years following the collapse, with the YoY% fleet growth figures being 8% and 9% respectively for 2010 and 2011, while in the last 10 years it has increased by 62% in terms of vessel numbers”. Vamvakas added that “after 2011, fleet growth started to drop gradually, reaching 2% in 2017. Demolitions volumes increased in this time period helping alleviate the market from some of these excesses, though even with these removals it took a while before a balance could be reached. Meanwhile, global trade took a serious hit just after the 2008 crash, with total volume falling by around 14% in 2009, according to WTO. Consequently, this huge gap between supply and demand sent rates plummeting. Capes saw the worst of this, going from exuberant rates of around $200,000pd at its peak, down to lower than $10,000 per day in the last quarter of the same year”. Meanwhile, “unlike previous financial and economic downturns, the recovery this time around was fairly swift, yet the ground work had been laid down for the gradually retreat of the double figure growth rates in trade. Today, with the orderbook to fleet ratio is at around 12%, with market fundamentals turning positive and with a considerably improved global trade growth noted over the past 2 years, the question is what will happen if all this starts to build up to over exuberance amongst shipowners. The truth is that another aspect of this crisis is still playing a key role here. More specifically, the ship financing market has not completely revived yet”, said Allied’s analyst. “Traditional ship financing houses are still limiting their involvement in the market. Over the past couple of years we have seen limited fresh lending, as well reduced credit lines and even withdrawals from previously agreed commitments. Alternative financing is only just coming into the spotlight, with Chinese leasing being the latest flavor of the month. All these have helped keep the orderbook at low levels, a fact that has facilitated to bring about some breathing space in the market. All in all, as shipping finance starts to become more accessible and finds new ways to reinvent itself and with market fundamentals continuing to improve, it is matter of time before we see if George Santayana’s quote, “Those who cannot remember the past are condemned to repeat it”, will be confirmed once more”, Vamvacas concluded.